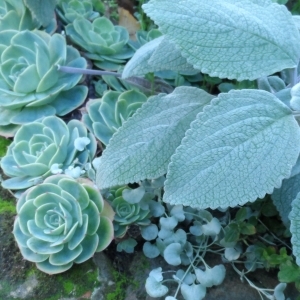 top left: going big on style in a small space, these silver echeveria, plectranthus and dicondra blend similar coloring with similar growing conditions. Duboce Triangle. top right and below: a deep mix of water wise perennials, wildflowers and natural materials make cottage style ours, Napa. Before I begin this botanical manifesto, let me start by saying that it is a work in progress, and there is the possibility that I may become even more opinionated before I go to print. Please don't take it personally if I denounce your favorite plants and design ideas, I'm simply taking a stand and using it as a springboard for dialogue. In developing my own personal gardening style, I hope to nurture questions as well as converts, with the goal of making 'Californa Cottage' a definable style. One last qualifier, I'm writing specifically about a Bay Area version of 'California Cottage'. I encourage others who live in different parts of the state to work up their own local ideas of what constitutes 'California Cottage', keeping a critical eye on plants, materials, climate, etc. because that is what prompted this foray: how best to adapt the cherished 'English Cottage Garden' style to the very American Golden State, and call it our own. Last year I wrote a few articles for my website, GardenTogether.com, that have not yet made it onto the new version. What follows is an updated version of one of them. I wrote it for San Franciscans, but the suggestions apply throughout the Bay Area. The California Cottage Garden- Bay Area version. The look I hear about most from customers, potential and otherwise, is 'English Cottage'. Quite understandably, it exemplifies abundance and variety and visions of dewy mornings spent gathering armloads of cut flowers for the table. Also understandably, you expect that this is the point where I dash everyone's floral fantasies by thwacking a ceanothus switch on the virtual chalkboard, right where I wrote the word 'D-R-O-U-G-H-T' in triple digit pixels. Well, we're not quite at that point, and I hope we never get there, but let's get two things out of the way. First, we're not in rainy Olde England and second, San Francisco is quite able to hold its own in the genre creating department. So, off I go on that ceanothus limb, to declare my version of 'San Francisco Cottage'. The June issue of 'Gardens Illustrated' arrived in the mail last week (it's a long flight from Sittingbourne), and it's my favorite issue this year, worth hunting down, just don't get attached to the lovely roses, or get me started on that topic. One article promised five key elements of the classic English garden, and while 'outsized topiary' was not one I could embrace, the other four had merit. I'll list those, with a San Francisco twist, and then some of my own. mixing vegetables with ornamentals - nothing to argue here, for most city residents, space is tiny, so integrating edibles is essential. My embellishment: incorporate native plants , not to feed us, but to feed the other occupants of our gardens. I like to go heavy on the natives, and use exotics in supporting roles, more about plant choices later on. creating unity- their example: paint all the furniture and outbuildings the same color to tie it all together. I don't know how many of you have gazebos plus benches plus planter boxes plus gates, but let's apply this principle to our plantings: use aspects of the plants to unify the garden . sympathetic choice of materials - see 'creating unity', they mentioned matching one's stonage in regards to walls and pathways. I say think through your hardscape choices and pick them for similar aspects, as you would with plants. My warm colored brick path harmonizes with my warm colored ginger gravel, but my cool colored 'urbanite' (chunks of sidewalk, cement patio, etc. ), not so much, so I'm gradullay covering it in greenery. Urbanite brings up another San Francisco element: be sympathetic to our environment and use recycled and repurposed materials . plan with the vertical - as in vertical views and gardening on the vertical. your view of the garden may mostly be from the second or third story, so carve out some vistas in a tree, include plants that show up well from above, like nasturtium and aeonium. Also, grow stuff up on walls, fences, decking, scrambling through shrubs and trees, hanging from underneath high decks and limbs. scale - we have small spaces, so scale things down to create that look of abundance without crowding. a great frame - an eyeglass chain says "a face is like a work of art. it deserves a great frame". I'm not saying stay within the lines all the time, but embrace some structure and overall your garden looks on-purpose and signals that some thought went into it. Don't underestimate the power of a great frame, stroll through the Contemporary Art wing in any museum to see what I mean. edit your drama - again, exercise a little more control. If you want a multitude of species in a small space, you're asking for chaos, which defeats the calming nature of... nature. Like putting random children in a small pen, there's bound to be conflicts, with no place to go and cool off. Instead, think through how different plants will look and grow together. the fish tank rule - fish tanks are small, contained in a frame, and viewed differently than a pond. I got this tip from an old aquarium book talking about choosing fish: have a few large specimens that catch your interest from a distance, then a few more smaller ones to draw the visitor in, then some even smaller ones that are only visible up close. vary the size and shape and impact of your flowers - when every flower is dinner plate sized, IT'S LIKE TYPING IN ALL CAPS, resulting in a loud bore of a garden. Consider scale, tend toward mostly smaller versions of mostly everything, use different flower shapes, vary the intensity of color. aim natural- plant engineering has created some, uh, interesting results. By reaching for natural versions of plants, you'll naturally tend toward flowers scaled to size, and foliage that won't get mistaken for wind blown fabric swatches. better plant selection - we're in a sweet climate for a wide range of plants and independent nurseries, so no excuse for coddling species that aren't happy. Always be water wise, and if you are going to use something ordinary, do something extraordinary with it. 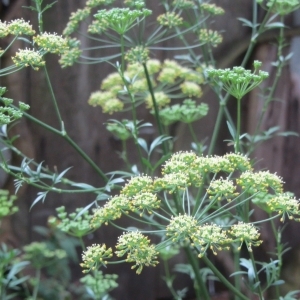 That was the article that appeared in the old GardenTogether.com site. I think it covers the 'Cottage' part of the equation well enough, now I'd like to explore the 'California' part, locally, as a Bay Area aesthetic. 'Mediterranean' is great starting place, but it includes all kinds of styles that in my opinion, look out of place in the Bay Area. My theory is that most designers look at gardens more like table settings than as part of the environment. For them it's more important that the plant's appearance 'works' with the look the designer is going for, and this is usually based on the client's home, and what furnishings are dragged outdoors to extend the interior. Plants get demoted to 'decoration', detached from the local environment. I propose we weigh more heavily in the other direction, base the look on the land. True, any kind of 'Cottage' look is unnatural, it relies on a 'cottage' and a concentration of plants corralled together for our enjoyment, but a cultivated plot is still part of the local environment, alive and connected to nature. To reference local habitat in making our plant and material choices is to grow that connection. So far I've talked about what to do, now it's time to take off the thorn punctured gloves and talk about what to avoid. Some of you may not agree with me but at least hear me out. If I can get you to reexamine how you garden, I've done well. Coincidentally, pets are on the list; to me they are one of the factors that determine whether a space is a garden or a yard. Whether it's romping through beds or stalking birds or relieving themselves, pets have an effect on the garden. The more that can be done to mitigate that effect, including separate areas for pets, the better. I'll come clean right off the bat, I don't like palms (too SoCal), ivy (too Harvard), spider plants (too Rain Forest), or anything from the house plant section of the big box stores. I'll make exceptions for the less thirsty ferns and Clivia if you have deep shade. And hardy tillandsias. I love tillandsias, as many look like something plucked from the Chaparral. If you want some fuzzy, sagey Northern California texture on the vertical, go with Tillandsias. I know there'll be a lot of pushback, but 90 percent of roses I see are not worth the effort or the pain they inflict. They need constant spraying for rust, rose slugs and LBAM; they want more heat in the Summer, and more cold in the Winter. Better to plant scented pelargoniums. That said, I love banksia roses, very romantic and thornless. If one day someone introduces a scented banksia cultivar, I'd consider it the perfect rose. I phased out phormium years ago due to its particular mealy bug, which slowly deteriorates the plants and are difficult to eradicate. I've also moved away from plants that read Tropical, and this is one I feel fits better in southern California. Super popular, but also super thorny, rampant, and too much neon for my taste. Chasing the tissue thin bracts all over the garden is no fun either. That said, I did get ahold of a thornless white variety, name unknown to me, that is covering a customer's fence very nicely. ...almost left this one out! Quit the dark bark, it highlights every non-chocolate colored leaf and flower that's on the ground. If you must have mulch, lighten it up with tumbled wood chips, or just chop and drop and let the debris that naturally falls in the garden be your mulch. There is a lot of grumbling lately about the use of mulch in general, the preferred alternative being using groundcover plants to supress weeds and shade the ground. Well, I think that's enough for now, if you feel compelled to collapse on a day bed after all that, I totally understand.